Still the business brought in $2.52 billion in the quarter, benefiting from strong U.S. cereal sales, which the company called the "best category performance" in years. "The consumers are responding to innovation as well as our marketing, we're actually quite encouraged about the (cereal) category," Chief Financial Officer Donal Mulligan said on a post-earnings call. "Our year-to-date performance and fourth-quarter plans give us confidence that we will meet or exceed all of our key fiscal 2019 targets," Chief Executive Officer Jeff Harmening said. 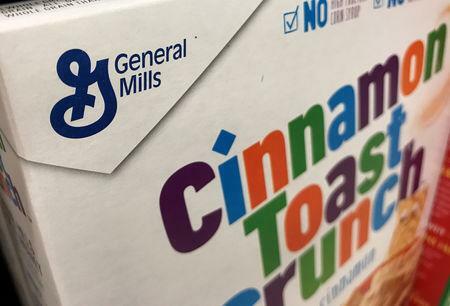 "In the minefield of packaged food stocks lately, where big misses, disappointments have almost become the norm, General Mills' strong third quarter, profit guidance raise and constructive tone should send the stock up by a solid amount," J.P. Morgan analyst Ken Goldman said.